Since many of us are still lagging on energy after a long and productive week of lectures and touring, today we had a lighter day in preparation for going out of town to Nara and Kyoto tomorrow. Today’s lectures also focused somewhat on the exchange that occurred between Ise and these two cities. 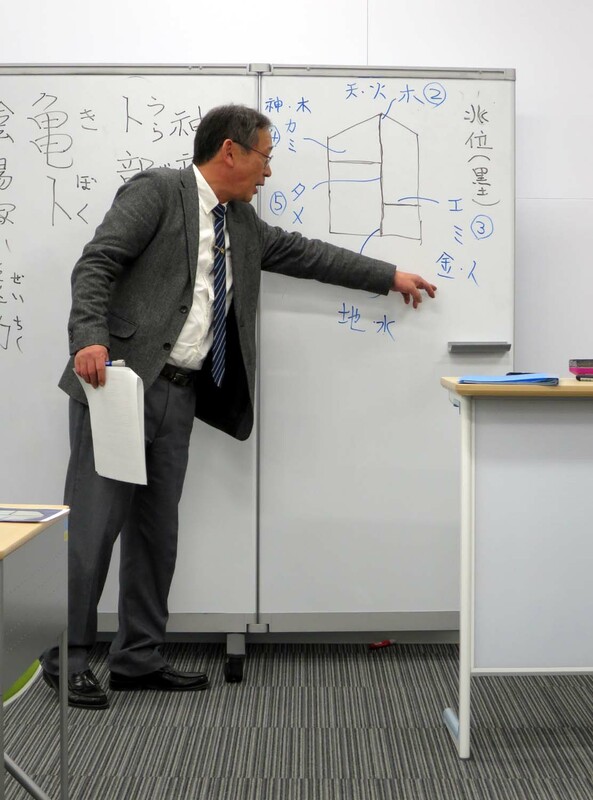 We were once again treated to a lecture by the university president, Shimizu-sensei, whose specialty is Nara. Beginning with the idea that the culture of the capital is represented by the term miyabi (refinement or elegance), in contrast to which localities, which were represented by hinabi (rusticness), he noted that Ise, having its special relationship to the imperial court in the capital, was at the same time as being a locality far outside of the capital, also uniquely connected to it, and thus represented by the word pinabi (though I’m afraid I did not catch the nuance to Shimizu-sensei’s explanation). With the act of the ancient emperor Suijin sending his daughter to find a place to enshrine Amaterasu, and the inevitable selection of Ise, Ise’s special relationship to the central area of government was secured. At the same time, it represented the oneness of government and religious practice at the time. This oneness was facilitated by the role of the emperor, who is considered to be a Shinto priest himself, and who conducted important rituals for the sake of the nation as a touchstone for kami like Amaterasu on earth. Enshrining and worshipping Amaterasu with various rituals (which Shimizu-sensei explained at length but I won’t go into in detail here) at Ise is thus inevitably connected to the emperor’s activities and presence in the capital, particularly through the performance of worship by his daughter, the priestess of Ise, who lived at Saiku and brought with her culture of the capital while serving as representative of the emperor. Many of the rituals performed by the emperor while he was in the capital were also performed at the same time in Ise. Some exceptions existed, however, such as Tanabata, which was celebrated in the capital but not in Ise. Our second lecture focused more generally on the modern significance of matsuri and the notion of ritual worship of kami. 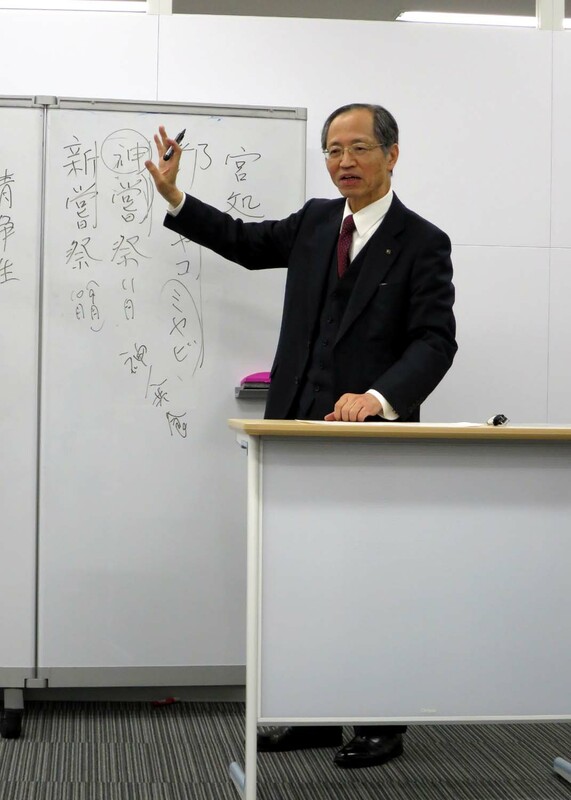 Our professor spoke of ideas connected to matsuri such as a desire for purification/cleanliness extending back to mythic tales of the past and continuing today, with over 300,000 matsuri ritual celebrations in Japan per year. They are thus deeply embedded in daily life, and people make matsuri activities and visits to shrines an integral part of their life experiences through prayer and performance. Kyoto was the focus of our afternoon lecture by Kamo-sensei, and we looked to two different connections as the main bridges between the Heian period capital of Kyoto and Ise. The first is the Saiō, the aforementioned female relative of the emperor (usually a daughter) who serves at Saiku as the priestess of Ise, though she actually only went to Ise itself from Saiku (set slightly apart from the shrine) three times a year. Who would serve as Saiō was typically decided soon after the enthronement of a new emperor. Kamo-sensei showing us how divinations are read. The other bridge between the court in Kyoto and Ise was the Shiō 使王, an imperial messenger who was dispatched to Ise from the court three times a year as well. Although the tradition of a Saiō serving at Ise ended in the early to mid 14th century, the dispatching of an imperial messenger to Ise continued through the early modern (Edo) period. The major task of a shiō was to present heihaku, or offerings, often of cloth or other goods, for matsuri honoring the kami, especially Amaterasu. The task of offering heihaku can be seen in ancient texts as early as the 8th century. Ise had traditions particular to its shiō selection, in which the person serving was usually above fifth rank (quite esteemed) and was selected by a process of uranai, or divination. An entire organization specifically dedicated to divination long existed within the premodern court, and its practitioners (onmyōji) are even now extremely popular figures in various media. Our classes ended early today and my trip to the library for research after it was not particularly remarkable, so I’ll end here. We’re off to Kyoto and Nara bright and early tomorrow!